That darkness is about to pass. Sometimes you find in literature beautiful expressions of technical terms that are otherwise dry and stuffy. Presentiment, by Emily Dickinson, is one of those beautiful expressions. Why did she decide to write a few words about twilight, and at the same time so succinctly summarise one of the key features of the circadian clock? Apparently Dickinson spent much of her adult life withdrawn from the world and, in doing so, she was probably in a position to watch and notice the hidden-in-plain-sight details of the world, such as how the length of shadows allow you to approximate the time of day and how grass may tell time without watches. Daily patterns in an organism have been noticed since the days of the ancient Greeks, who saw daily rhythms in sleep and wake and how flowers open and close. However, these observations did not do anything to suggest that organisms could actually tell the time themselves. The first experiments to determine if organisms have an inbuilt sense of time were described in plants nearly 300 years ago. 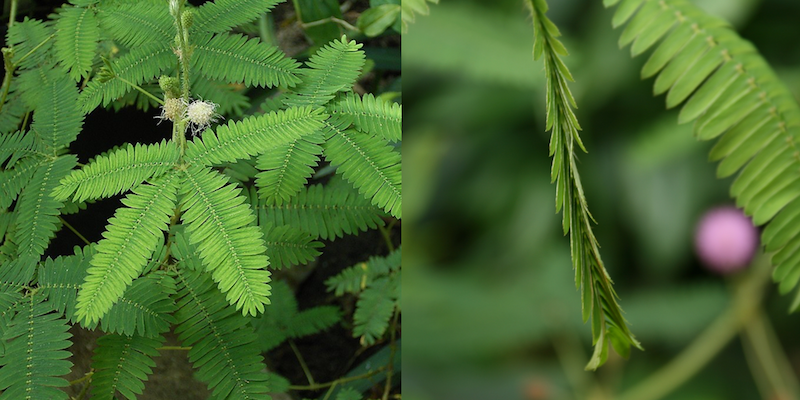 In 1729, Jean-Jacques d’Ortous de Mairan was curious to see if the daily opening and closing of the leaves of Mimosa pudica was a direct response to sunlight. To test this, he placed the plant in the dark and recorded the movements of the leaves. His results showed that the leaves continued to open and close even in the dark, leading him to conclude that the behaviour was not a response to sunlight, but in response to some other factor. He did not directly attribute the movements to an internal clock as he could not exclude other potential factors that would trigger the behaviour: temperature cycles, or changes in other parameters like humidity for example. In subsequent experiments, other scientists such as du Monceau repeated de Mairan’s work while controlling for more and more factors each time. Each time they saw the same result: the leaves continued to open and close with a daily rhythm, even in the absence of all environmental signals. One fundamental attribute of circadian clocks, that they are only ‘circa’ dian, was not recorded until nearly a century later, when Augustin Pyramus de Candolle, controlling for light, temperature and humidity cycles, observed a 22 to 23 hour rhythm of opening and closing in a plant that was exposed to constant light. This free-running rhythm, so named because the rhythm seemed to drift across external time, is a clear marker that the rhythm is independent of external factors. This observation really confirmed the idea that plants have an endogenous time keeper, and finding the free-running circadian rhythm is a critical experiment in most research groups that investigate circadian biology. The circadian clock is synchronised to external time by external factors such as light or temperature. These factors reset the internal clock to ensure it stays tuned to the 24 hour day. The circadian clock, as an endogenous time keeper, allows plants and animals to predict daily events and get ready for them. With this ‘presentiment’ given by the circadian clock, an animal is able fire up its digestion before it wakes at dawn, ensuring it is ready to eat as soon as it gets up. Similarly, a plant is able to move its leaves into an optimal position to receive the sunlight before the sun rises, so that it doesn’t miss out on any of the sun’s energy. Equally, at twilight, it can move them into a position to limit water loss before night falls. Within cells, timing information given by a clock allows the cell to confine different cellular processes to different times of the day, keeping conflicting processes apart in time, and providing temporal order. Much of the live on earth has evolved this ability to generate temporal order, including animals that live outside the reach of the sun’s energy. I wonder if Emily Dickinson knew this when she wrote about shadows and grass? Pingback: How do you study circadian rhythms? Next Next post: What can a blind cavefish tell us about circadian clocks?